North Korea has decided to wind its clock forward half an hour to match its time with the South's, two years and eight months after it decided to adopt its own standard time, News 1 reported. Accompanied by his wife Ri Sol-ju, Kim is said to have pointed to the two clocks hanging inside the Peace House, located on the South's side of Panmunjom truce village, and said that this "pained his heart," before suggesting to Moon that the South and North "first unify the time." Until 2015, Pyongyang used the same time (135 degrees East) as Seoul but adopted its own standard time which was thirty minutes behind KST. 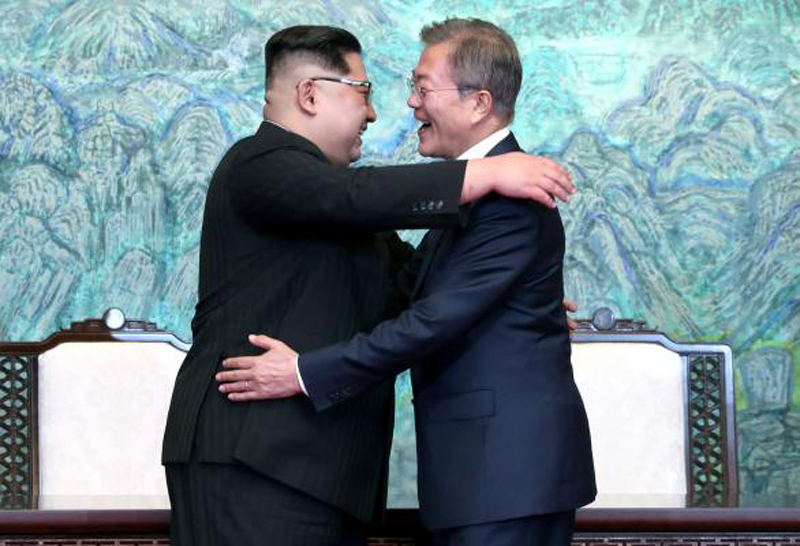 The North Korean leader said, as Pyongyang was the one that changed the time, it should be the one to make the adjustment again, JoongAng Ilbo reported. Yoon said this indicates Kim's willingness to actively coordinate with the international community. "This was not a planned agreement but it was agreed upon during the discussion," another senior presidential official said. "It wasn't a situation where we could announce this on the day of the summit, so this has been announced today." On Friday, the two leaders held the first inter-Korean summit in eleven years, after which they signed and declared the three-part Panmunjom Agreement, pledging their commitment to full denuclearization of the Korean Peninsula and improving cross-border ties to seek eventual unification.